Isn't today just a good day? I guess it is! 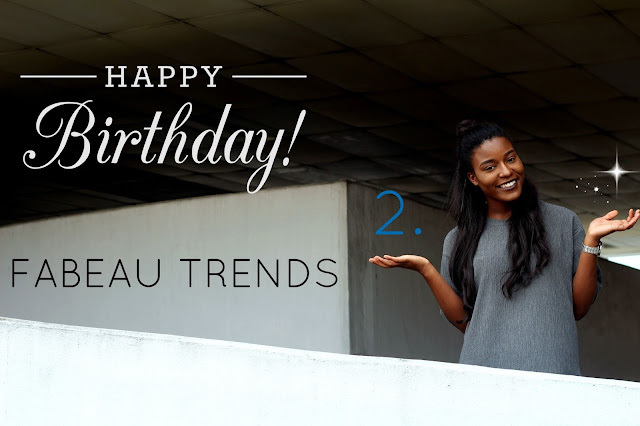 From the headline you already noticed that today is the second anniversary of FABEAU TRENDS ... time's flying like so quick and I can't believe that I made the second scale. I almost even forget that the second anniversary was around the corner. Let's just say that I luckily remembered perfect in time that there was something big coming up. As a matter of fact, I wouldn't be where I am today without you guys and I mean it! You were supportive of me from day one & even brought me back to it when I almost lost faith in doing. Thank you for always beeing there and taking the time to visit my blog. I'm just so overwhelmed by all the positive feedback I get from you guys! Keep on reading to see what I got special for you guys ..
Let me shortly just skip to the outfit I'm wearing in this post. I was hooked up again by Reno who surprised me with this stunner boots that literally are to die for in my opinion. I mean, the bottom of the heels are just killing me. Never saw a shoe as similar as this before and I'm just so in love with it. Apparently, autumn is just around the corner and guess what .. yea I'm excited! That's the only way for me to show off this boots more often. Nevertheless, my surprise which is a sign of appreciation from me to you guys for all the support and love I got to experience in just 2 years .. crazy!! Never could even imagine to make it this far and to even bulding my own company Blogger Apartment. I also have to give a big thanks to God who always been on my side and literally gave me the approval on blogging. Therefore, I'm not just running 1 but 2 giveaways (fashion & beauty packages) on my Instagram (here) and Facebook (here) and wish all of you luck who enter. The giveaways are open worldwide and easy to enter in just a few steps. You have time to join until Thursday, 8th of October!